Oakland's many murals already make the landscape feel distinctive. Even though Oakland is covered in hundreds of murals, it's not every day you get to see one created from start to finish. That's one goal for the first-ever Oakland Mural Festival. "A lot of times, mural lovers in the community don't even see when new projects are going up, so we're trying to highlight the actual process of how a mural is created," said Sarah Siskin, director of Bay Area Mural Festival (BAMFest) and a member of Los Pobres Artistas collective, two groups behind the Oakland Mural Festival. BAMFest hosted festivals in South Berkeley and Richmond in the past two years. This year's edition is the first to take place in Oakland, and it's sponsored by Visit Oakland as part of Oakland Art Month. From May 12 to May 19, groups of artists will paint nine murals around the Jack London district. Siskin sees the festival as an opportunity to bring together various artists from Oakland to help celebrate the city's rich historical past and current space in the art world. "We have chosen artists that are dedicated to representing the cultural and historical context of Oakland and considering where they are in the communities that use those spaces," Siskin said. More than 25 artists are participating, including local legend Emory Douglas, who was an artist for the Black Panther Party from the 1960s to '80s; Mike "BAM" Tyau, a graffiti artist turned videogame graphic designer; Art Forces, the same group behind the Oakland Palestine Solidarity Mural; and members of the Trust Your Struggle and Creative Shields collectives. Los Pobres Artistas members have been working with students from Oakland International High School to plan and design their sea life-infused mural. The students will also be involved in the actual painting and receive a stipend for their weeklong residency during the festival, according to Fred Alvarado of Los Pobres Artistas. Festival organizers hope to extend this local involvement to the greater community. Attendees are encouraged to not only watch artists create their murals but also engage with them as they add to their city's art. Alise Eastgate, who will participate in the festival with her partner, Jack Eastgate, said she'll be looking to both members of the community and the mural's location to inform their art. "When people come up and they talk to you, that energy is coming into the piece and those ideas can come into the piece," said Alise Eastgate. "The people around can be inspiration." Members of Creative Shields also said they're excited to talk with folks as they create their mural. "We're community muralists. It's all about building with the people where they're at, and providing the environment that allows them to feel welcome there," said Creative Shields member James Shields. "That's most of the fun." Given that artists frequently come and go in Oakland, it's hard to put a finger on exactly what makes Oakland art "Oakland." But the diverse backgrounds of the artists taking part in the festival — hailing from as far as Fiji, Chile, and, of course, Oakland — seem to reflect the general tone of the local art scene: simultaneously broad and inclusive. The festival organizers left the themes of the murals open to the artists. Some plan to portray Oakland in all its waterfront glory as a port city, while others spoke to highlighting aspects that are ancestral and indigenous to the town. Common threads include more politicized issues such as migration, Oakland's sanctuary status, and gentrification. The Eastgates, for example, will focus on gentrification and colonization alongside the environmental realities of human and animal migration. "We're being very conscious of the reality of gentrification in Oakland and making sure that our art is countering that and is referencing what's already here, and Oakland's history and legacy," said Alise Eastgate. To Alvarado, this particular medium is primed for artists to weave community concerns into what they create. "[Murals are] a really powerful tool that can be used for a lot of good, from beautifying the space to making people aware of different issues," Alvarado said. "They can give people a place to channel frustration into a productive means." 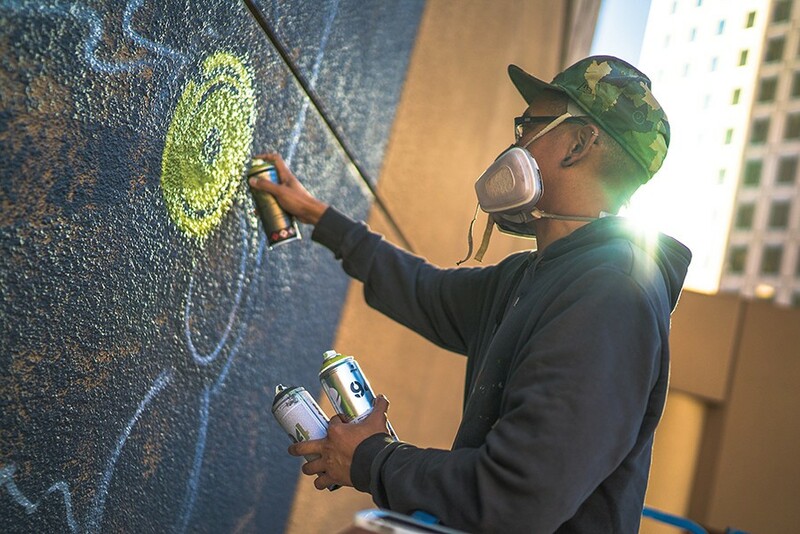 In addition to the festival, there's a pop-up art gallery (54 Washington St.) in Jack London Square displaying studio work from this year's muralists as well as artists who have participated in past BAMFests through the end of May. The gallery will be open daily during the week of the festival with more information about the artists and maps showing where to find the murals. It will also host a closing party with walking tours and entertainment organized by local arts collective Oakhella. For muralist David Burke, who will work on a visual "Love Letter to Oakland" decked out with QR codes, this art form inherently belongs to the community — exemplified by how the festival allows Oakland community members to experience the creation of their own art. "It becomes part of their collective experience," Burke said, "and must reflect the stories, the diversity, the values, and the histories of that community."